A short time ago, e-commerce sales were only considered a bonus for household care brands. Now, the digital channel has become a crucial part of the equation for the market. As consumers become more open to purchasing these types of products online, big-name brands are becoming more vulnerable to digitally native startups such as Brandless and The Honest Company. Consumers are also redefining shopping, as they expect brands to satisfy their needs and values by offering convenient and unique experiences that are technologically advanced. Here’s what big-name household care brands such as Procter & Gamble, Colgate-Palmolive and The Clorox Company can do to beat their digitally native competitors, deliver on customer expectations, and win online. According to Nielsen, Household Products is the third most popular FMCG category purchased online, with 51% of consumers having bought products such as laundry detergent, paper towels and household cleaners via e-commerce. Most products in this category are well-suited for the digital channel, as purchases are routine and mundane and products are generally easy to ship. When it comes to sales, e-commerce represents 9% of the $5.6 billion U.S. Household Care market. This is low compared to categories such as Beauty and Pet Care, but is high compared to perishables such as Produce, Meat and Dairy. More significant than e-commerce’s share of sales, however, is just how quickly this channel is growing. In the Household Care category, online sales grew by over 34% compounded over a three-year period. In comparison, growth of in-store sales was almost flat at 0.6%. 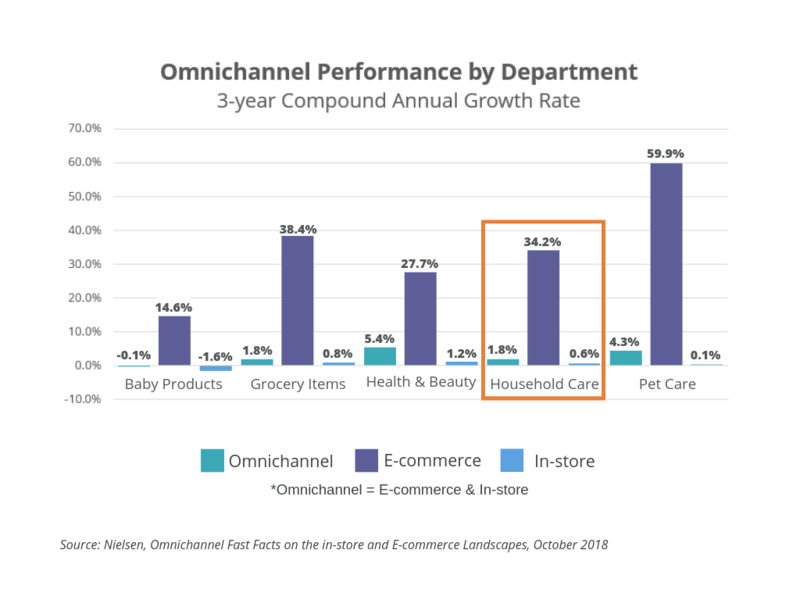 While physical stores will always be an important sales channel for household care brands, the key to long-term growth is clearly e-commerce. 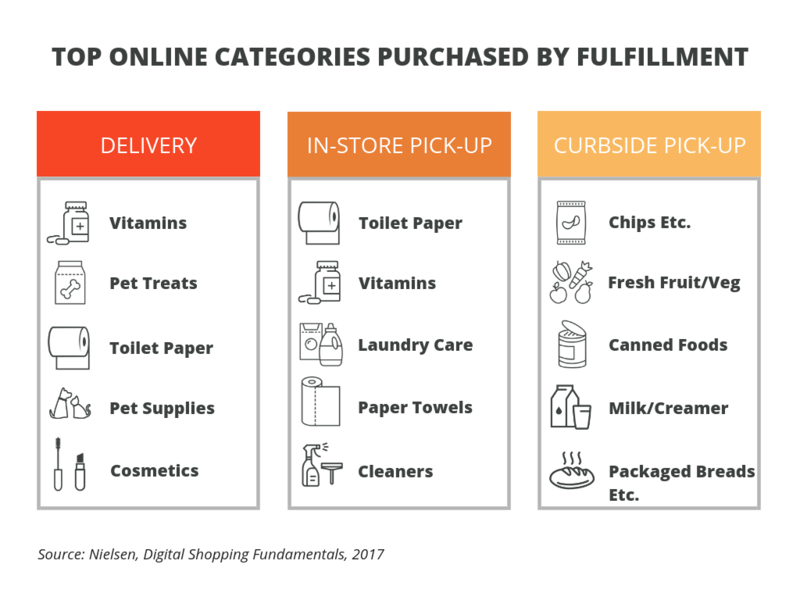 A significant portion of this online growth is being driven by grocery and mass retailers that are expanding their omnichannel capabilities with click-and-collect fulfillment options. Click-and-collect shopping has increased 30 percentage points in the last two years and now represents nearly half (48%) of online grocery sales. When it comes to the types of products consumers are purchasing via click and collect, household care is far and away the most popular category, accounting for four of the top five products purchased online and picked up in stores. This means that household care brands need to prioritize relationships with retailers that offer click-and-collect fulfillment options. Walmart is the company that is dominating in this area, due in large part to its massive physical footprint. In the United States, for example, 90% of the population lives within 10 miles of a Walmart or Sam’s Club store. Amazon, which is largely considered Walmart’s biggest rival, doesn’t own nearly the same amount of real estate, even after its acquisition of Whole Foods. This severely limits the company’s omnichannel capabilities. Subscription services and automated ordering are also driving e-commerce growth in household care. 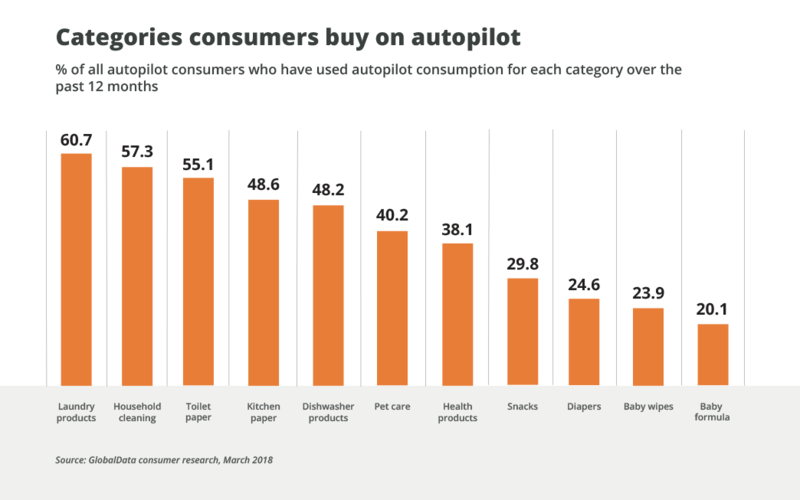 According to GlobalData consumer research, the top five categories bought “on autopilot” are Laundry Products, Household Cleaning, Toilet Paper, Kitchen Paper and Dishwasher Products. These types of products are well-suited for subscription-based or automated ordering because they are bought on a regular, recurring basis and typically do not involve much research or consideration after the initial purchase. Once a customer finds a home care product that works for them, they are prone to stick with that product and don’t often venture out to explore new offerings in the category. 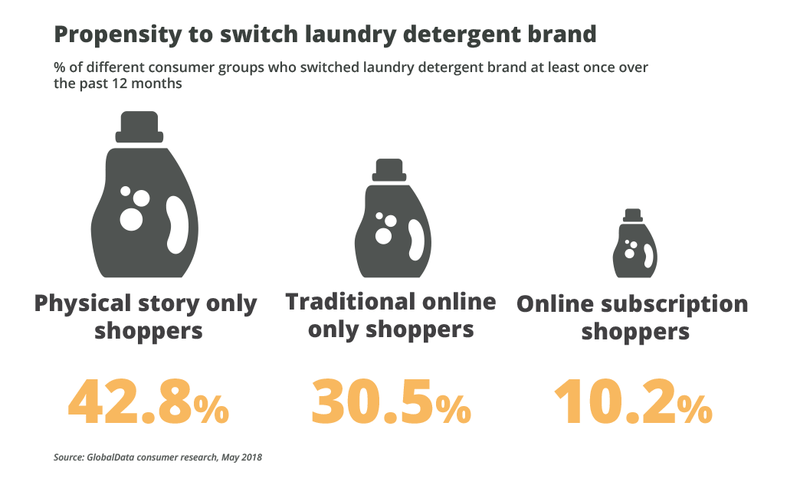 The propensity to switch brands is even lower for online subscription shoppers, with only 10.2% having switched laundry detergent brands over the past year. For household care brands, this means your products need to be available through subscription services such as Amazon Subscribe and Save. It’s also important to explore automated ordering technologies such as Amazon Dash Buttons. If you have the proper infrastructure in place, it may also be worth it to test out your own D2C subscription service. Procter & Gamble, for example, was an early adopter of the Dash Button, making it easy for their customers to easily reorder Tide laundry detergent and Bounty paper towels via Amazon Prime. It also tested out a subscription service for Tide Pods called Tide Wash Club. 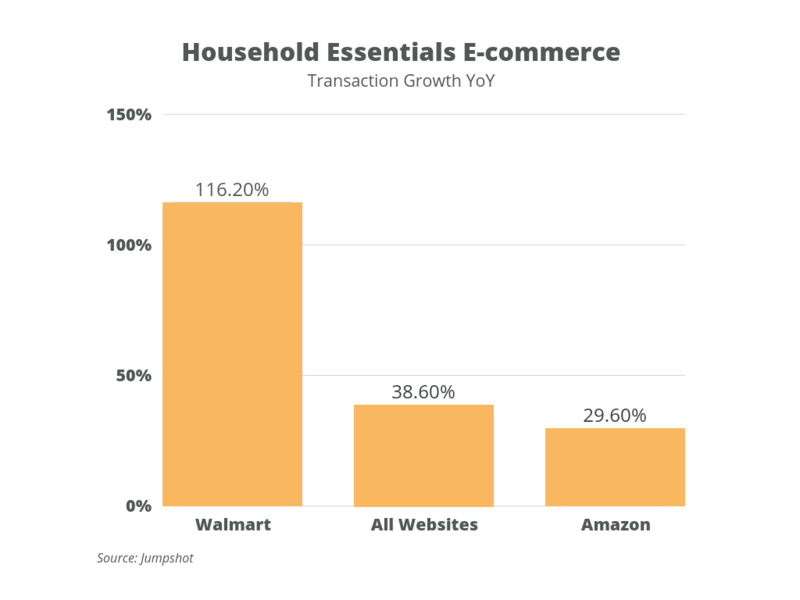 When it comes to e-commerce market share, Amazon accounts for 88.8% of Household Essentials purchases. However, a recent report from Jumpshot found that the company’s transaction growth is tapering. For example, in the Household Essentials category, Amazon experienced 29.6% transaction growth year over year in the second quarter of 2018. Transaction growth for all the websites Jumpshot analyzed across this category was 38.6%. Meanwhile, Walmart grew online Household Essentials transactions by 116.2% over the same period. Because Amazon is clearly still the market leader when it comes to Household Care e-commerce, brands must start by making sure they have a solid presence there. However, focusing solely on Amazon isn’t enough. 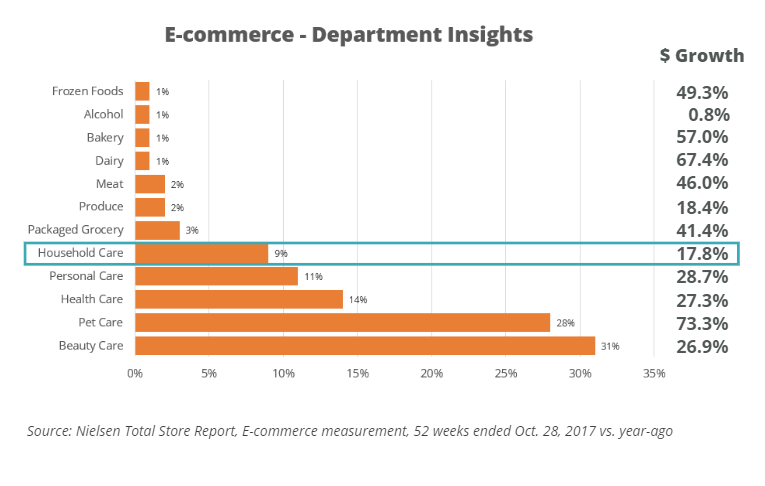 Walmart, Target and other retailers are growing their digital sales fast, thanks in large part to omnichannel capabilities such as click and collect. Many of today’s consumers start their product discovery process online even if they end up making their purchases in stores. For this reason, it’s crucial for your products to have maximum search visibility on retailer websites. This means that when consumers search for keywords related to your product, your products appear as close to the top of the search results as possible. Start by compiling a list of relevant keywords you want your products to rank for. These should include both broad and specific terms, and they must be relevant to the products. Next, optimize your product page content to include these keywords. Incorporate these terms in a natural way, avoiding “keyword stuffing” that can negatively impact customer experience. 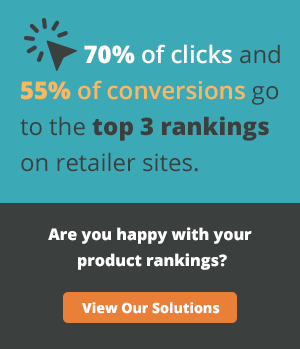 Once you’ve optimized your listings, monitor your products’ rankings for target keywords across retailer websites to see how your efforts impacted your search visibility. Continuously optimize content for the best results. Once a customer has found your product via site search, the content on the product page allows them to research the item and determine if it is a good fit for them. First and foremost, this content must be accurate, and it should provide everything the customer needs to know. Take advantage of all of the available content options, including photos, titles, bullet points, descriptions and enhanced content. Expand on the information on the product packaging, further demonstrating how the product will benefit the customer. Use this opportunity to answer any common questions or concerns consumers have, as well as to explain how the product compares to its competitors. In looking across the household care landscape, it’s clear that the path to growth is no longer through physical retailers. With current growth rates, there is no denying the impact that e-commerce is having on the industry. To guarantee online success, household care brands must align digitally with established buyer behaviors and add value through convenience and technology. Additionally, brands must invest in search engine optimization and high-quality product content, both on Amazon and other online retailers.